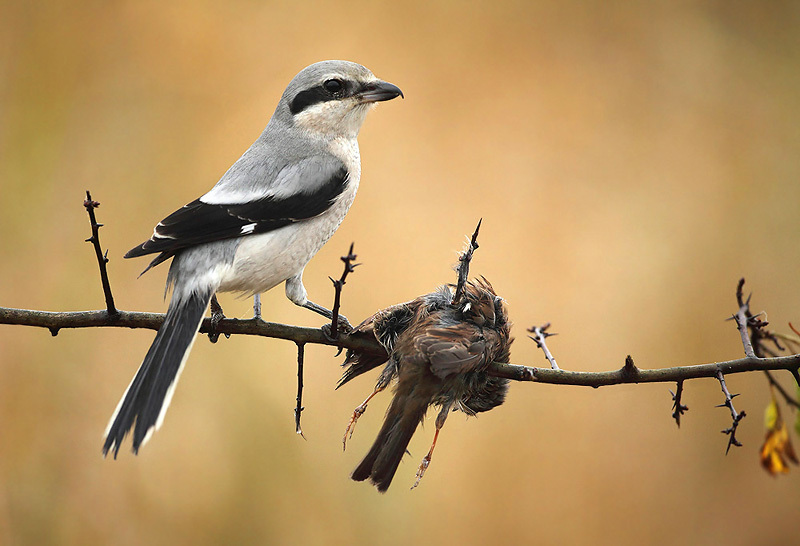 Like most birds, shrikes eat arthropods. Unlike most birds, they also eat lizards, birds, and small mammals. They will stake out mouse holes and bird nests, awaiting their prey; they can spot birds “frozen,” an antipredator defense, and capture them before they move. They take down mammals with their bill, catch birds with their feet in mid-flight. 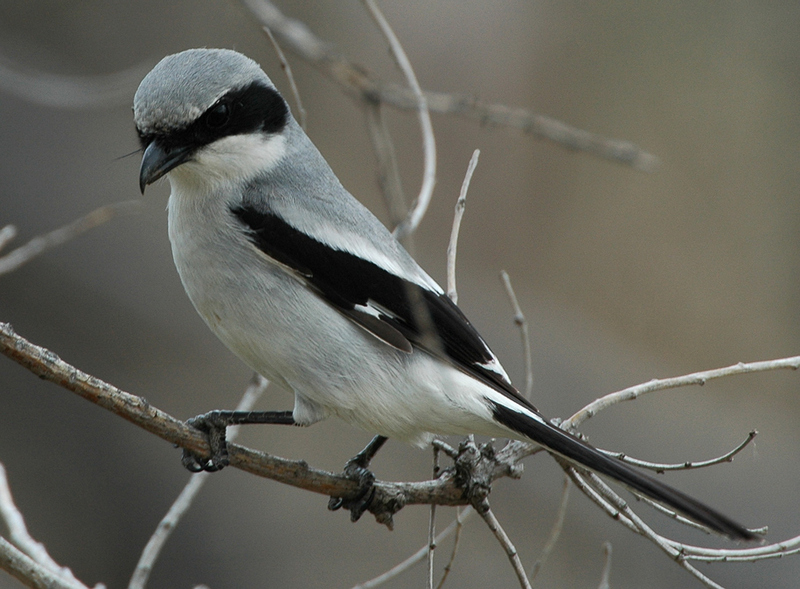 Northern Shrikes, at 65-75 g, have been known to attack mammals larger than 500 g; they have also attacked Mallards, Sharp-tailed Grouse, and Rock Ptarmigan. They have successfully killed pigeons and American Robins. They can fly while carrying prey that weigh more than they do, including voles, lemmings, and Blue Jays. 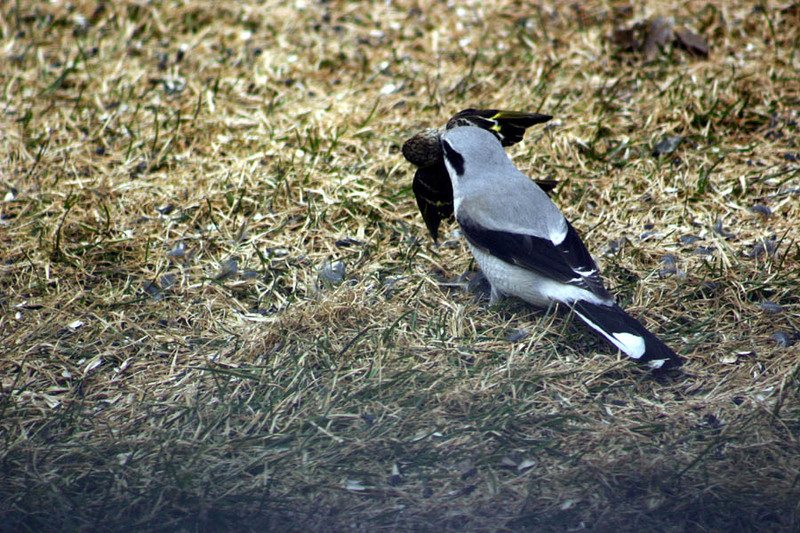 Northern Shrike with a Pine Siskin. Photo by Charles Makarewich. They kill their prey by severing its spinal cord with that tomial tooth. Then, like trophy hunters, they display it. They impale the carcasses of their prey on the sharp branches and thorns of shrubs and trees and the barbs of barbed-wire fences. With the carcass firmly secured, they pull it apart into pieces of swallowable size, starting at the head. Often they do not eat it right away, however, but leave it impaled, saving it for later. 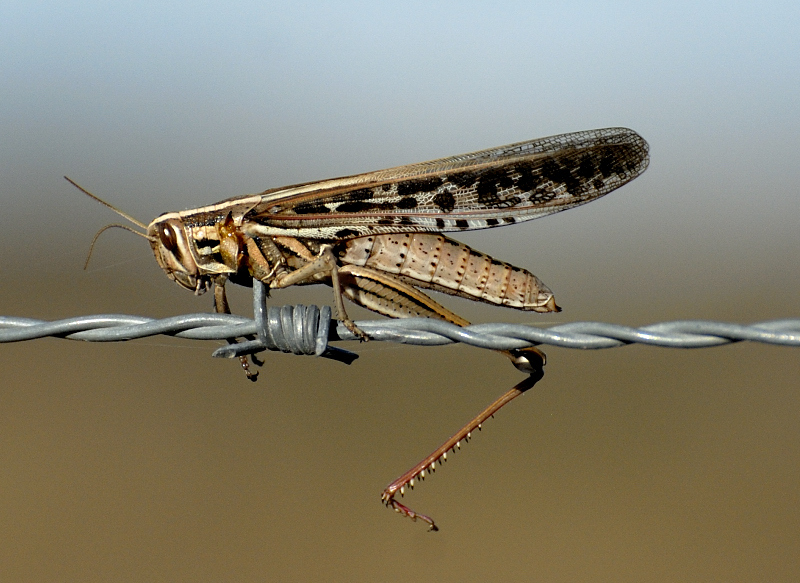 Impaled grasshopper. Photo from otterside.com. Great Grey Shrike with impaled prey, a Dunnock. Photo by Glenn Vermeersch. This tall, lanky, hunch-shouldered group is among the better visual arguments for the relationship between birds and dinosaurs, and it hasn’t lost its theropod ferocity either. 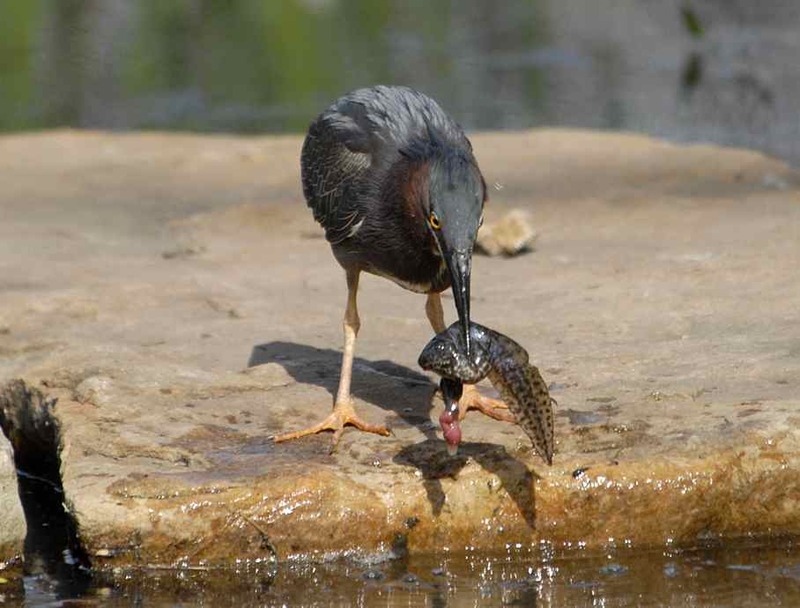 Herons catch their prey by launching their heads downwards and either grabbing or just stabbing their long bills straight through fish, frogs, goslings, voles, baby rabbits, and pretty much anything else smaller than them. 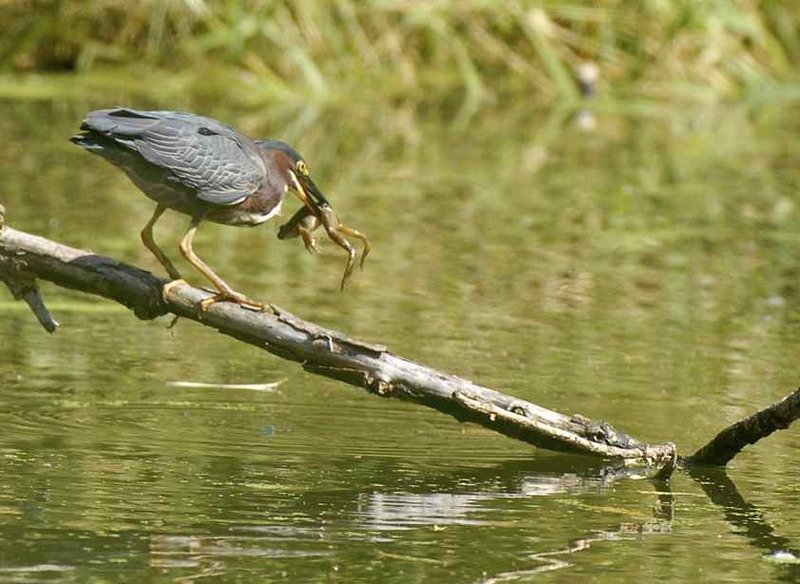 Green Heron with a frog. Photo by M. LaBarbera. 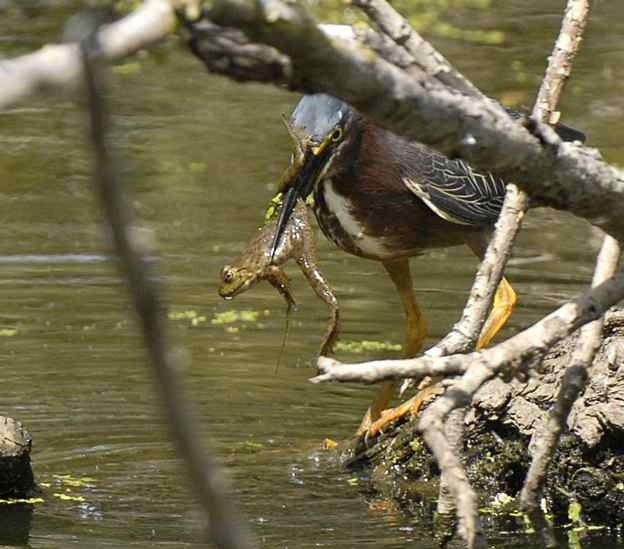 Green Heron with another frog. Photo by M. LaBarbera. 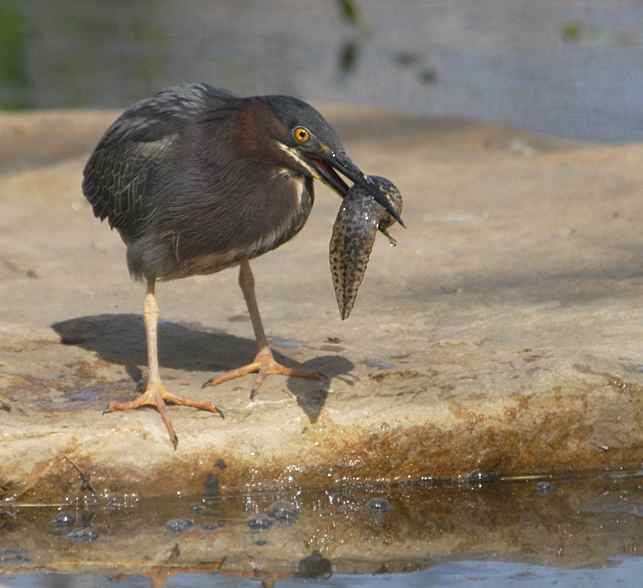 Green Heron with a tadpole. Photo by M. LaBarbera. Tadpole gore. Photo by M. LaBarbera. 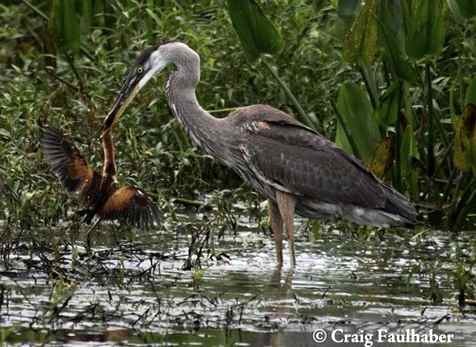 Bigger herons, like the Great Blue, can take bigger prey. Great Blue Heron eating a Least Bittern. Photo by Craig Faulhaber. If you think he won’t be able to eat that bittern, you’ve sorely underestimated him. I’ve seen a Great Blue Heron eat a ground squirrel. It made a big lump in his neck, and he looked uncomfortable, but he did it. Just be grateful that you’re too big to fit down that crooked throat. Male Southern Cassowary and chick. Stop thinking it’s cute—it’s deadly! Deadly! Photo by Vladimir Motycka. You don’t have to be a fish, mouse, or other small animal to be scared of cassowaries: there have been over 100 cassowary attacks on humans, and at least one documented human fatality. 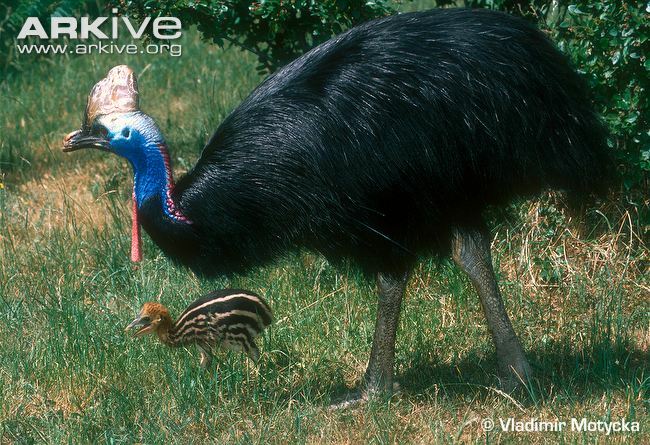 These large, flightless birds live in New Guinea, nearby islands, and parts of Australia. They are generally shy, which is good, because an angry cassowary is bad news: they can run up to 31 mph, and they can kick. Their powerful legs end in three toes, one of which has a 5-inch-long “dagger-like” claw. A cassowary kick is basically a knife slash. Fortunately, most cassowary attacks are avoidable. Usually they are from cassowaries who have been fed by humans, or provoked: the cassowary who killed a man did so after he tried to beat it to death. So: don’t give cassowaries treats, or trick them (see what I did there? ), and you’ll be safe. Hooded Pitohui. It’s even in good Halloween colors! Photo by John Dumbacher. 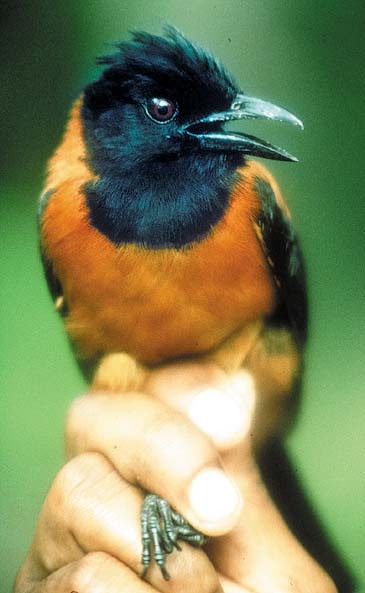 In 1990, researchers preparing specimens of the Hooded Pitohui (also from the New Guinea region—beware New Guinea…) found themselves experiencing “numbness, burning, and sneezing”. Locals warned that the bird should not be eaten unless skinned and specially prepared. The intrigued researchers isolated samples of an alkaloid substance from specimens of Hooded, Variable, and Rusty Pitohuis and administered them to mice. At low doses, the mice were partially paralyzed; at high doses, they went into convulsions and died. The toxin in pitohuis is the same as that found in the poison-dart frogs whose skin is used to poison blowgun darts. 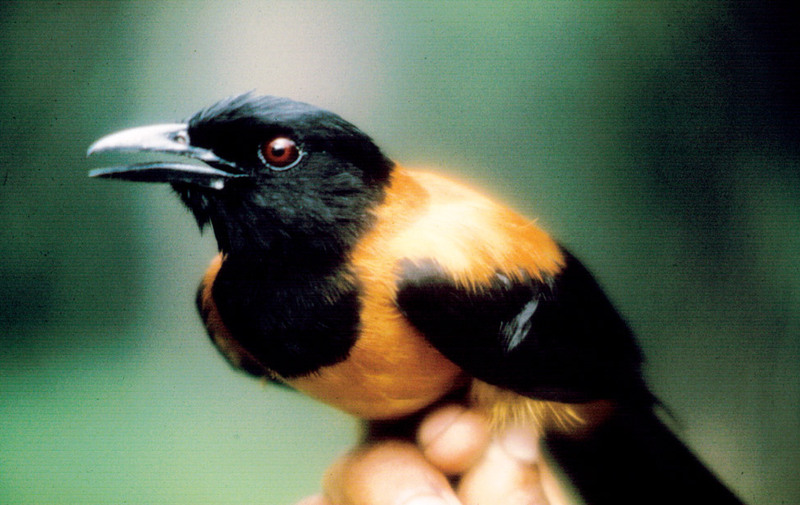 The toxin is concentrated in the skin and feathers of the pitohui, but unlike the frogs, pitohuis have traces of the toxin in their muscles as well, which is impressive since it ought to impair or kill them. Unless someone slips powdered pitohui feather into your drink, you’re probably safe from these toxic birds: even if you are the sort of person who devours random wild birds with the skin on (and if you are, please, stop), you might think twice before eating a pitohui, since they give off a “strong, sour odor”. Hooded Pitohui: my nomination for Official Bird of Halloween 2012. Yeah, that’s not a real thing. Photo by John Dumbacher. In conclusion: stay human and stay away from New Guinea, and you’ll have a safe Halloween—at least as far as birds are concerned. Photo note: many of these photos were found using Google Images. I have tried to credit all of them. If one of these is yours, and you want me to take it down, please let me know and I will do so immediately. This entry was posted in general science-y stuff, miscellaneous and tagged birds, cassowary, egret, Halloween, heron, pitohui, science, shrike by toughlittlebirds. Bookmark the permalink. Great action photos and startling information. These predators are vicious. Wow – you’d never imagine some of these smaller birds being such predators. We see a lot of Blue Herons in Minnesota. I will no longer think “Isn’t it beautiful?”, instead thinking “What’s that lump in its neck?” Great informative and appropriately creepy! Glad you like it! Hopefully you can wonder what the herons have just eaten and still think that they’re beautiful… They’re just less beautiful-like-a-delicate-doe and more beautiful-like-a-stalking-tiger. I had no idea that herons ate other birds, much less medium-sized birds! Yikes! Awesome post. When they stick their prey on branches does that mean they mark it?Or do they eat it in one go?